Cardiff City will re-lay their home pitch before their next home match against Rotherham on 23 January. 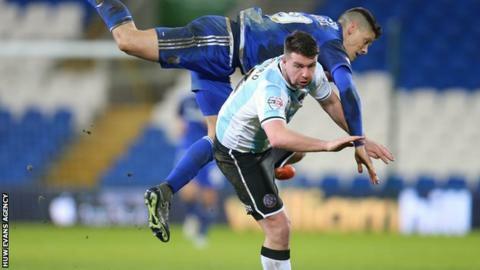 The surface had deteriorated recently, prompting criticism from Cardiff's players and manager Russell Slade. A Bluebirds statement said the pitch had been stripped away on Tuesday. "We had a cycle of deterioration that led to us having to make a decision. We took a window of opportunity with the weather," head of Stadium Operations, Wayne Nash, told the club website. "We'll let it settle down for a couple of days, before letting the boys have a run on it at the end of next week. It will then be ready for the match against Rotherham United." The pitch will be removed again in the summer when it will be re-lain and re-seeded. Wales are expected to play a friendly against Northern Ireland at the Cardiff City Stadium on 24 March. The Cardiff City Stadium pitch - a mix of natural grass and synthetic fibres - was set to be re-laid last summer but those plans were put on hold because of Wales' match against Belgium last June. Heavy rainfall during the winter has seen the turf cut up badly, with the previously lush, green surface becoming muddy and coarse. It appeared to be in particularly bad condition during Cardiff's FA Cup third-round defeat by League One side Shrewsbury on Sunday.